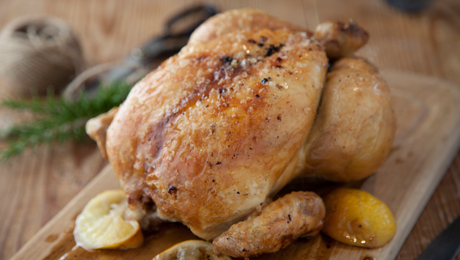 A wonderful flavour to add to your roast chicken dinner. Leave the butter at room temperature for up to an hour to soften slightly. Finely grate the zest of the lemon and chop the thyme. Add to the butter and season with some salt and pepper. Loosen the skin from around the chicken with your hands to manipulate some of the lemon butter under the skin, directly onto the fl esh, and gently massage this into the breasts. This will make the chicken nicely fragrant. Return the skin to its original shape. The rest of the whole lemon can be cut in half and pushed into the cavity of the chicken with some sprigs of thyme and a bulb of garlic. This will add further fl avour. Transfer the chicken to a roasting tray and cook in the oven at 170°C/ 340°F/gas mark 3 for 1 hour and 20 minutes. Allow to rest for a further 10 to 15 minutes before carving.